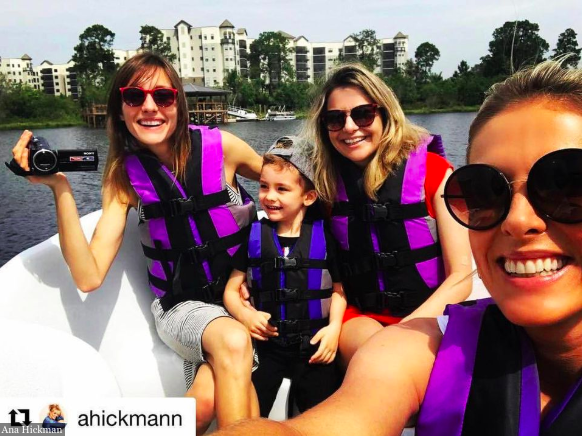 Brazilian model Ana Hickman with family at The Grove Resort & Spa in Orlando. Tosiyuki Nakamura. Odds are you have no idea who that man is, or where he is from. It is not Japan. Nakamura is a Brazilian. He says he brings in $2,900 per month from a three-bedroom vacation home bought in 2017 for $330,000 at this place called The Grove Resort & Spa, once a deserted shell around 4 miles from Disney’s west gate. For the record, that is the equivalent of R$10,150 per month, which happens to be 6.5 times more than the average monthly income in Sao Paulo. Nakamura represents a trend in Central Florida. At least at this newly developed, and still developing, residence hotel in Orlando. The Grove sells homes and rents them out as suites to people visiting Orlando. Nakamura’s unit is over 1,100 square feet. He can change the flooring and paint the walls if he wants and close the door off to guests, but most people buying are not doing that. Benchmark Resorts & Hotels manages the property, and the owners collect a portion of the rental income. Disney is expanding. They are building new Star Wars attractions at Hollywood Studios, and a Star Wars-themed hotel … of course. Ratatouille is coming to Epcot. So are the Guardians of the Galaxy. Toy Story Land is coming to Hollywood Studios. The World of Pandora just opened at Animal Kingdom last year. In line at the Na’avi River Journey, a lazy boat ride through artificial biolume on Pandora, Brazilian Portuguese is second only to English. The lobby at The Grove Resort & Spa has a large picture of a Disney character in a Brazilian soccer jersey kicking a soccer ball. Ivete Sangalo was here. Ana Hickman was here. Brazil’s version of Justin Beiber, a Youtuber named Biel; he was here, too, snapping Insta’s of himself curling 40 pounds (with a spotter). They got a complimentary room. Celita Gomes, on the other hand, did not. But she said she liked The Grove Resort & Spa so much, she bought two properties. “I already have a property in Orlando at Storey Lake that I also use for rental income and vacations,” she says about a single-family unit gated community in Kissimmee. “When I first saw the Grove it was still being rebuilt, and I fell in love with it,” she says in Portuguese. “I bought my first unit for investment only. I’ve seen other properties in Orlando, but I liked the Grove because of its large resort complex design and because of return on investment. Once I started seeing that I could make money on it, I bought another one for leisure and family use,” she says. It’s not only The Grove that’s bringing in foreigners, something once affiliated only with South Florida skylines. All of Orlando is being built up, and at least two other properties have the same setup: resident hotels, bringing mostly foreigners who are accustomed to living in large developments. Northeasterners, tired of the cold, and New York City residents, tired of the taxes, make up the majority of American buyers here. Encore Resort in Orlando is similar to The Grove. It’s a single-family home complex that is part of the Disney rental home network. Foreigners dominate it. The Grove investors, BTI Partners, got very lucky. New developers will never get such a big piece of real estate for so deep a discount. BTI bought it as a distressed asset in 2013 from a British guy named Paul Oxley, later wanted by the FBI. Oxley’s Maesbury Homes came up with the plan to build a resort called Grande Palisades in 2004. When the economy went south in 2008, he disappeared. He declared bankruptcy in 2013. All told, BTI bought it at flea market prices: around $150 million for an 878-unit property where the average home there now sells for about $370,000 (range is $290,000 to $450,000). They’re still building. Another 300 or so units are under construction; cranes and hammers and drills are still a fixture among the palm trees on site. A total of 330 have been sold, and of that total a whopping 65% have beem sold to foreigners. Like Miami, most of them are cash buyers. Some 25% of them are Chinese, buying it sight unseen. Another 20% are Latin Americans, and of that group, almost all of them are Brazilians. The remainder is Americans buying individually or through investment clubs, says Kevin Mays, director of development at BTI. “This is a unique time for Orlando. The window of opportunity has not closed like I think it has in South Florida for the time being,” he says. In May 2016, the Grove units were priced between $250,000 and $290,000. They ran a celebrity strategy with Brazilians because they had contacts in Miami and São Paulo who made it happen. It wasn’t that they were purposely singling out Brazilian Disney fans, though it was arguably a genius move. As a nation, outside of the U.S. and Japan, no country is as obsessed with all things Disney as Brazil. Florida is the No. 1 destination for international investors buying U.S. real estate. Orlando is second to Miami with Latin Americans accounting for 34% of the buyers. Within the Orlando area, occupancy rates for hotels are around 73.5% on average all year, according to Census data. Orlando real estate has appreciated 62% over the last five years, according to Dataloft, a U.K. consultancy specializing in real estate. The average five-year price increase for homes was 34% in the U.S. and 35% in Brazil. Orlando’s average home prices are around $290,000. All the expensive ones are near the theme parks and golf courses. Florida property taxes are 1.7%, typically around $4,500 annually. Take that New York. Miami is about luxury and a place to hide money. Orlando is about family and a place to visit as a tourist. In mid-April, their new Surfari Park opened. It cost BTI $18 million. They want it to look like a typical Disney-area resort hotel, and it does. It has all the bells and whistles. On a sunny day in late April, parties are renting cabanas and ordering food (expensive food) from a food truck. There’s a water park, with two long slides splashing down into a lazy river. There are two guys in shortie wetsuits teaching kids and adults how to bodyboard or surf in a wave pool. There’s a kids splash area, the usual towering gizmo of water splashing about and kids under the age of four parading around sopping wet. There are pools for sunbathers who don’t want to hear anything but the birds, a good 100 yards away from the Surfari Park. In that area is a smaller closed-off pool for younger children. Someone from The Grove is playing Disney trivia with them. At night, some mosquitoes begin their flights over central Florida. It was a swamp once, and there is water everywhere. Now, to listen to people like Fucci, it is sort of the new Miami insofar as the foreigners are enticing developers to build here now, too. Jimmy Buffet’s Margaritaville is selling out Caribbean-style single-family cottages in Orlando. They’re breaking ground—tractors, and mounds of dirt here and there. The Margaritaville brand of restaurants is owned by Brazilian firm International Meal Company. The property will probably have a Margaritaville restaurant on-site, so even if individual Brazilians have not yet bought in, IMC will be their flag-bearer.